Copyright (c) – Mosaic Records, L.L.C. Design [Production] – Ink Well, Inc.
Track 2-14 is wrongly credited to R. De Viva, but it his the alternate name of the song (Razao De Viva) and not a composer credit. Track 3-7 is misspelled "Insensalez" instead of "Insensatez"
"From the moment Duke Pearson arrived in New York in 1959, his compositions had immediate currency and impact. Duke was able make a composition harmonically interesting, melodically memorable and rhythmically in the groove. Compositions like “Jeannine” and “Chant” were turning heads. Those same qualities informed his lyrical piano style and stunning arranging abilities. His watermark runs through Blue Note’s output in the ‘60s. As a recording artist, he led lyrical trios, soulful sextets and a roaring big band. But his final Blue Note sessions (1968-70) showed his palate expanding to embrace Brazilian rhythms and melodies and impressionistic harmonies. The first album to mark a change in Pearson’s direction was The Phantom which add two rhythm guitars and two percussionists to the rhythm section and featured Bobby Hutcherson’s vibes and Jerry Dodgion’s flute. Duke said at the time, “I was interested in trying to be somewhat more exotic than previously and in illuminating diverse moods within the exoticism….an evocative scope of colors.” It also swings like hell. Subsequent sessions which were eventually issued in the ‘90s as I Don’t Care Who Knows It add to that set-uo Airto Morreira’s percussion and more horns which Pearson arranges magnificently. Andy Bey sings the title tune, a Buddy Johnson obscurity. It Only Happen With You moves further into the Brazilian realm with the presence of Hermeto Pascoal and, on three selections, Flora Purim. How Insensitive combines two interesting sessions. With Flora Purim and an all Brazilian rhythm section, Duke recorded lilting, swinging versions of four Brazilian compositions. With the New York Group Singers’ Big Band, a 16-voice chorus led by Jack Manno, he recorded seven pieces, including a reprise of his “Christo Redentor” which launched the wordless choral craze six years earlier on Donald Byrd’s A New Perspective. 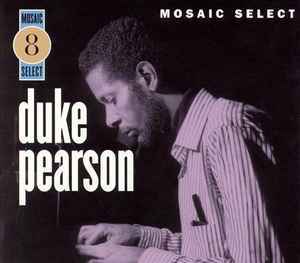 The set closes with the rarest of all Duke Pearson albums, Merry Ole Soul. Pearson, Bob Cranshaw, Mickey Roker and Airto swing ten Christmas classics with taste and class. All in all, a successful, varied program of music from a consummate artist who rarely sat still. The set includes two previously unissued tracks."